"The government has decided to win the war as soon as possible" said the Sri Lankan President today in an address to the nation. She claimed that the draconian regulations promulgated by her government last week under the Public Security Ordinance was only a temporary measure and would be put into effect only in extreme situations. The President accused some political leaders of fishing in troubled waters and lambasted the United National Party for aggravating the Tamil problem in the past. She said the island was facing a national crisis. While emphasising the need for communal harmony in many parts of her speech, she said that the seven hundred thousand living abroad would give more Dollars to the Liberation Tigers if the conflict is not resolved. She charged that the UNP had colluded with the LTTE in the past. The UNP did not extend its support to her government for evolving constitutional reform in the past four and a half years the President said. She said that all political parties should engage in united action as a pre-condition for solving the problem. 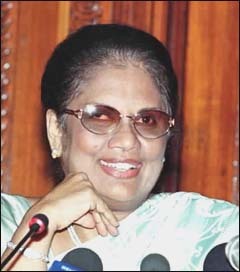 "My husband and I supported the Indo-Lanka Accord in 1987" Ms.Kumaratunga pointed out. She claimed that she was looking into the welfare of soldiers killed in action and those who are permanently wounded and help them and their families to buy and find housing.